After the iconic summer vacation, the winter holidays are the busiest season on America’s highways. 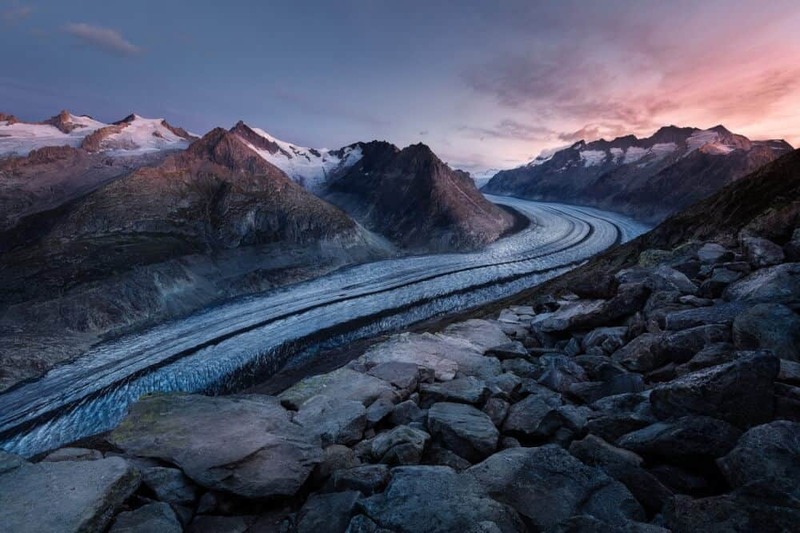 Whether you’re headed to Grandma’s for Christmas, or you’ve splurged on that family ski trip, there’s a good chance a winter road trip is in your future. Winter road trips can be a bit more challenging than their summer counterpart. For one thing, you won’t find many roadside picnics, and the allure of the open road is tempered with fickle driving conditions. But that’s no reason to stay home! There are some benefits to winter travel and snowy back road adventures, provided you keep your family happy and your car in top form. Here are some tips for surviving the winter road trip, whether you’re embarking on a weekend adventure or a cross-country excursion. No matter what time of year you’re driving, the most important thing is to drive safely and defensively. 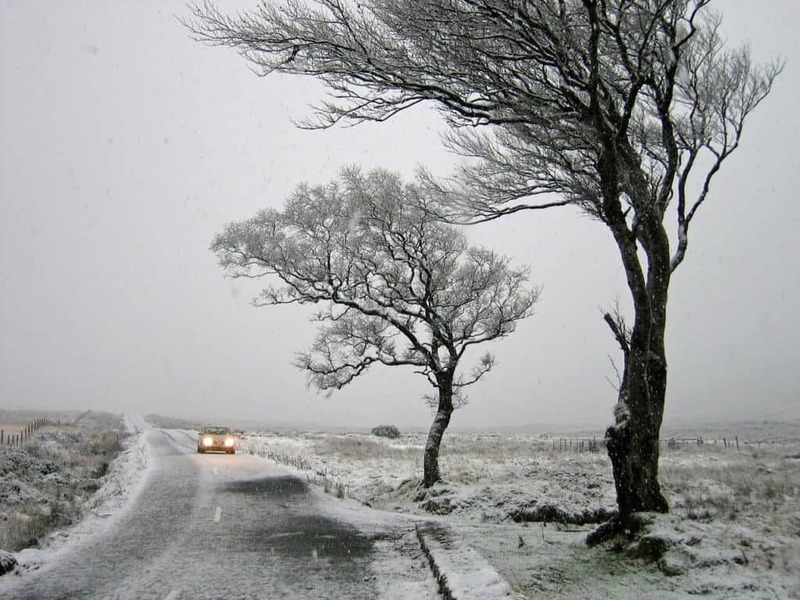 In winter, this means knowing how to drive in snowy and icy conditions, ensuring your car is equipped for winter travel, and packing appropriately for possible mishaps or emergencies. 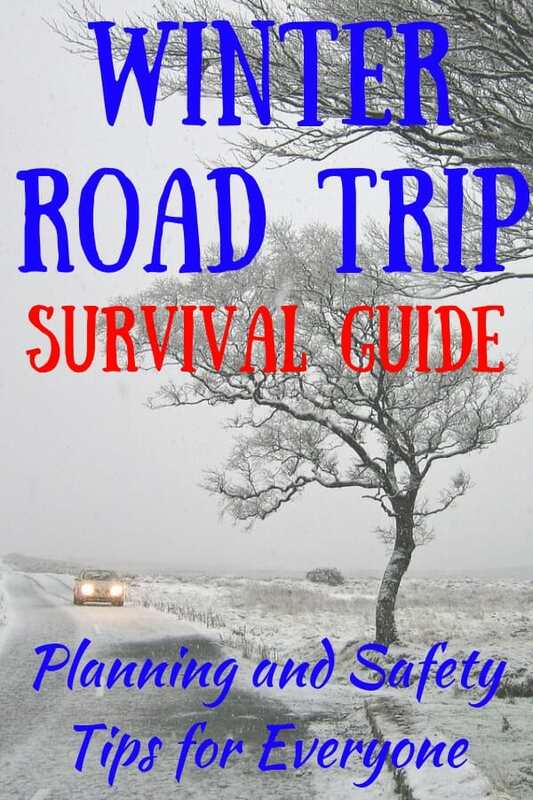 The following tips will help you stay safe during your winter road trip. Invest in a roadside assistance program. We use AAA and they’ve never let us down. 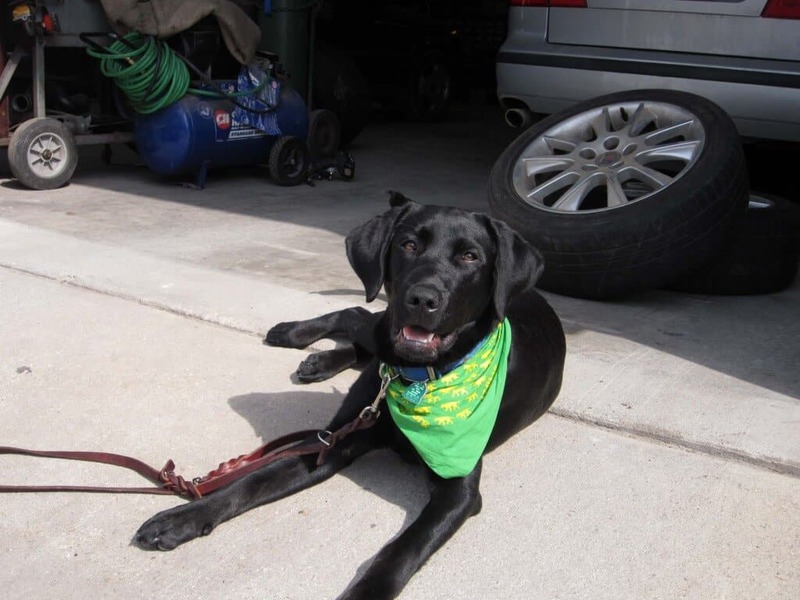 We have used them to tow us out of ditches, fill our empty gas tank, and rescue us when our dog locked us out of the car in a fit of excitement. If you think that your dog (or child) might do the same to you, remember to keep your cell phone on your person at all times. AAA provides 24-hour emergency roadside assistance, discounts on many hotels throughout the US, and identity-theft protection. I believe the cost depends on where you live, but in Northern New England, we pay $49 a year, which includes five miles of free towing. AAA Plus gives you 100 miles of free towing and is probably a better choice if you’re traveling in really rural areas (back roads for the win!). Flynn supervising as our snow tires are mounted. Snow tires are awesome! I didn’t need them when I lived south of New Jersey, but now I have them put on just after Thanksgiving. What a huge difference snow tires make for winter travel. Be sure to check your tire pressure before your trip, especially if the temps have dropped. Air contracts as it cools, so your October tire pressure will have dropped significantly by December. Have your car serviced by your local mechanic. 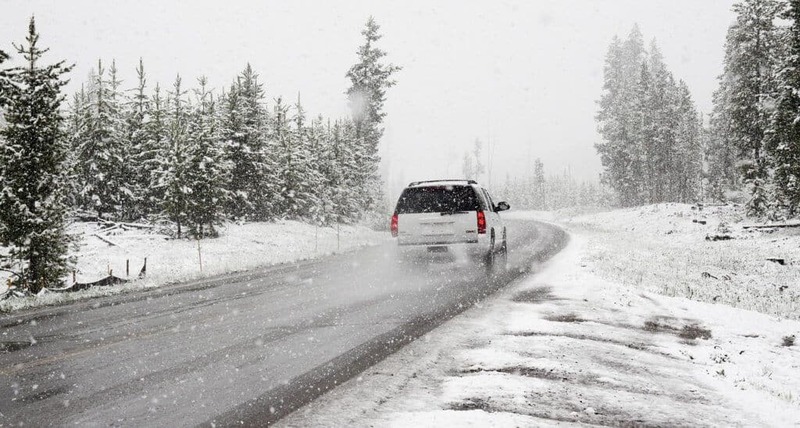 Before your winter road trip, you should have your battery, tires, wipers, hoses, and other systems checked to ensure your car can handle a long journey. Of course, you can do this yourself if you have the skills. If not, ask your mechanic to inspect your car before heading out on your journey. Check your car’s fluids before each trip. While this isn’t specific to winter road trips, there’s a good chance you’ll need that extra washer fluid if you’re driving in slushy conditions. Check your oil, transmission fluid, and coolant levels too, and keep extra fluids in your car just in case. Keep your gas tank at least ½ full. Keeping your tank full will prevent your gas lines from freezing up, and it will ensure that you have a reliable source of heat if you are ever stranded. Dress Appropriately. Driving in full winter garb isn’t much fun, but no matter what you where when you’re driving, be sure to have appropriately clothing with you. And if you’ve got teenagers who think they know how to dress, remind them that they need boots, mittens, and warm coats. They may think they’ll be all warm and cozy in the car for hours on end, but they won’t be smiling if they have to get out and walk. Towels and rags for spills, dirty windows, etc. 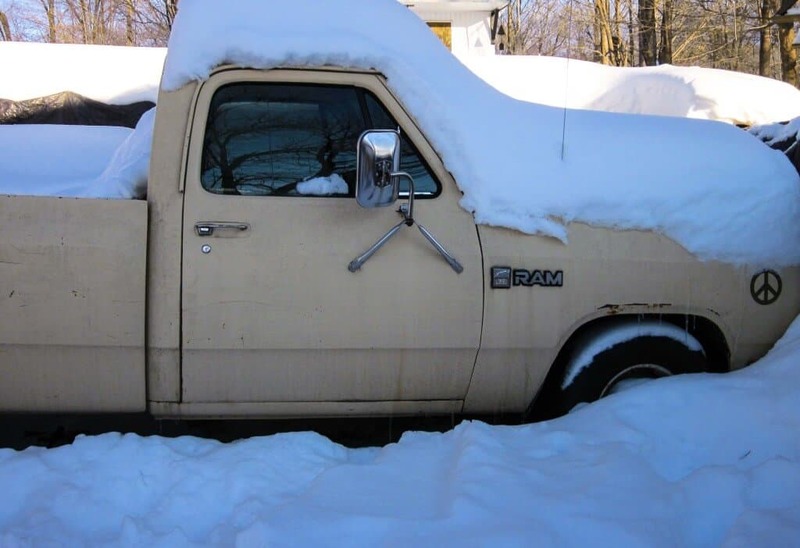 Driving in the winter can be challenging, and over the past few years, even southern states have experienced winter conditions. No matter where you’re headed this winter, follow these winter driving tips to stay safe on the road. Drive slow on icy roads. Accelerate and Decelerate very slowly. Sudden braking and acceleration could cause you to skid. Increase the following distance between you and the car in front of you. Instead of the 3 or 4 second rule, shoot for keeping 8 to 10 seconds behind the car in front of you. If you can, slow down instead of stopping. This is especially important on hills where you may slide backwards if you try to start and stop again. If you become stuck or snowbound, stay with your car. It makes it much easier for rescuers to find you, and your car provides shelter from the storm. Call your roadside assistance service, and if you don’t have service, call the police. Tie a bright cloth on your door handle or your antennae as a sign of distress. If you are stranded at night, keep your dome light on so that others will see you. If you’re planning a winter road trip, but you’re worried about taking your car, you may want to consider renting one. This is especially ideal for those of you that drive small cars, older cars, or cars that don’t perform well in winter conditions. Rental cars are usually new or just a few years old, so the likelihood of maintenance problems is minimal. You will save wear and tear on your own car, and you’ll have the opportunity to choose something that is a bit more fun to drive. One option that we’ve chosen in the past is to fly to our winter holiday destination, and drive a rental car home. Why? Because we always end up with more luggage than we anticipated! Renting a car allows us to exchange gifts with our family without worrying about how much space they’ll take up. Winter road trips can be challenging, but we know you’re up for it. Here are some tips for keeping everyone sane en route to your destination. Audiobooks. Have I said this before? They are such a lifesaver that it’s worth repeating a hundred times. Here are our favorite books and stories read by awesome narrators. We also make use of our Audible subscription on just about every road trip. Hot chocolate. Is it worth having to stop and pee? Absolutely. Fill a thermos before you head out, and suddenly, your winter road trip becomes just a bit more magical. These Hydro Flask vacuum-insulated coffee mugs will keep your cocoa hot for four hours, and the locking lid prevents spills on your upholstery. Pit Stops. In the summer, we tend to stop for picnics, hikes, and other outdoor adventures. We do that a bit in the winter too, but sometimes we have to settle for the mall – our favorite pit stop at night or in bad weather. You can still run around a bit in the mall (with some restraint), and the rarely-visited food court (at least for us), becomes a special treat. Christmas Music? Maybe not — I can already hear my kids groaning at the thought. If I were part of a different family, I would recommend that everyone sing carols and get silly. Maybe that family is yours. Have a rest-area snowball fight. Great fun if everyone has their their mittens handy. 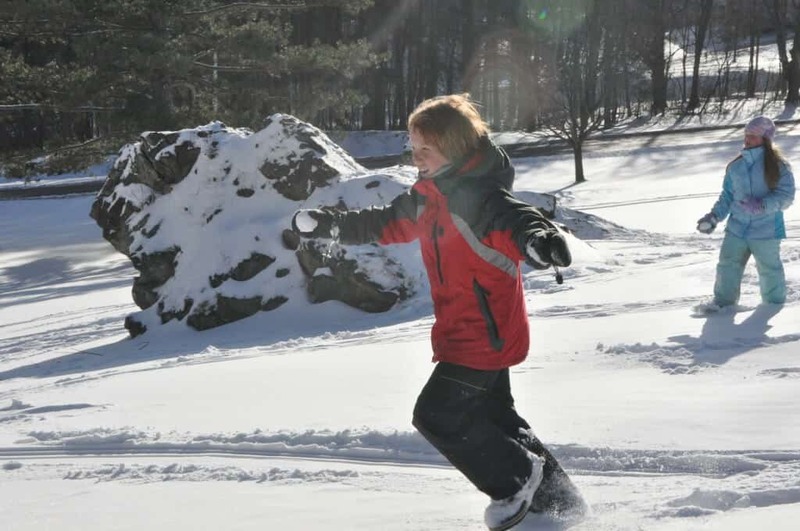 This is a great way to blow off some steam, and it might be a reason to wish for snow before your trip. There’s always time to stop for a snowball fight on your winter road trip. Eat good food. Keep sugary snacks to a minimum unless you are prepared for a meltdown. Instead pack trail mix, cheese and crackers, beef jerky, and carrots with hummus. Stay in a hotel with an indoor pool. We’re a camping family, but winter road trip camping is beyond us, so when we have to, we splurge on a hotel with a pool (and a hot tub). Parents and teenagers always look forward to winter road trips that involve hotels. Find the best deals and read reviews on hotels with pools on TripAdvisor. Got any winter road trip tips to add to our post? Leave a comment below to make our day. And if you found this post useful, we’d love it if you’d share it far and wide. Lots of great tips here! I’m not much of a driver myself but I love the idea of doing a long road trip one day. And would love to do one in Iceland too, so these tips would be handy if we went in the winter. 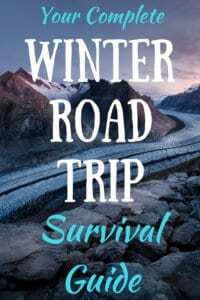 While reading this I realised that I have never had a big winter road trip! I did a week in Alaska once by car but I wasn’t driving (which was probably a good thing because i had no idea about any of these tips!). Also love the tip about audio books – for me that is a must on any long road trip. These are some really helpful tips. I feel that thinking ahead and preparing for the “maybe” is so worth it. I always feel proper coverage like AAA is well worth the few extra bucks because it can make a difficult situation much more bearable. This is such a great post full of important safety advice! I had an accident a few years ago in the UK driving in the winter. I took the car off the road on black ice. I must admit I’ve not driven in bad conditions like that since. I have saved this post to one of my pinboards just in case I’m ever brave enough! Great winter road trips. 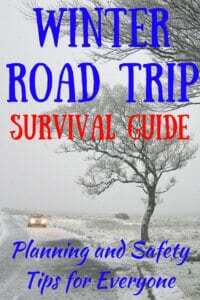 I prefer road trips in the summer, and often forget the extra precautions required in winter and cold weather. These are wonderful tried-and-true tips. I’m not very fond of snowy, winter trips since we live in San Diego but necessary to get to our skiing destinations every year in Utah. Electronics like ipads and smartphones have kept my kids occupied during those trips. Love the idea of a pit stop for a snowball fight. Thank you for visiting, Mary. I agree that electronic devices can be really helpful in many situations. Thanks for sharing your tip. Lots of good tips for a winter road trip here! Last year my bf and I did a 5 month road trip from Nov – Apr but luckily only hit snow once in New Mexico! A road trip like that is a good test for any relationship! When my (then) boyfriend and I survived and thrived on a mega road trip, I knew it was meant to be. These are great tips. I got caught in icy mountains in Colorado a few years ago. As a desert dweller, I had no idea what to do! If you’ve done it before it will all come back to you. Have a great holiday! These are perfect tips! Especially with everyone traveling during the holiday season. I adore the photos of your pups. So cute! I love to take road trips as a family. These are great tips! These are great tips! I am actually planning a winter road trip for February and I was a little nervous at first but now I am excited. I think everyone should use these tips for all road trips! These are all such good tips! I think that EVERYONE needs to read your driving tips. I live in CO and we got a ton of snow yesterday. There were so many accidents today and yesterday because people were accelerating or driving too quickly. We have a winter ski trip to Utah coming up and I certainly plan to use some of these tips. It has been some time since we have done a road trip. I grew up in Lake Tahoe and recall my parents driving in the snow. I am a pro at driving in it now, we head up there often since it is only a few hours from us.